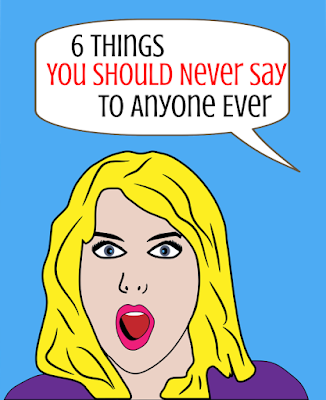 If you've got an Internet connection, you've probably already seen dozens of articles instructing you on the 7 Things Not to Say to Stay-at-Home Moms and the 5 Things Mothers of All Boys are Sick of Hearing. Also, you can't tell little girls they're pretty or say that a baby is chubby. Turns out there's very little you can say to anyone without mortally offending their delicate eardrums! I know you want to be sensitive, but finding an article outlining what you can't say to every conceivable type of person you might meet throughout the day... well, that's a lot of reading. 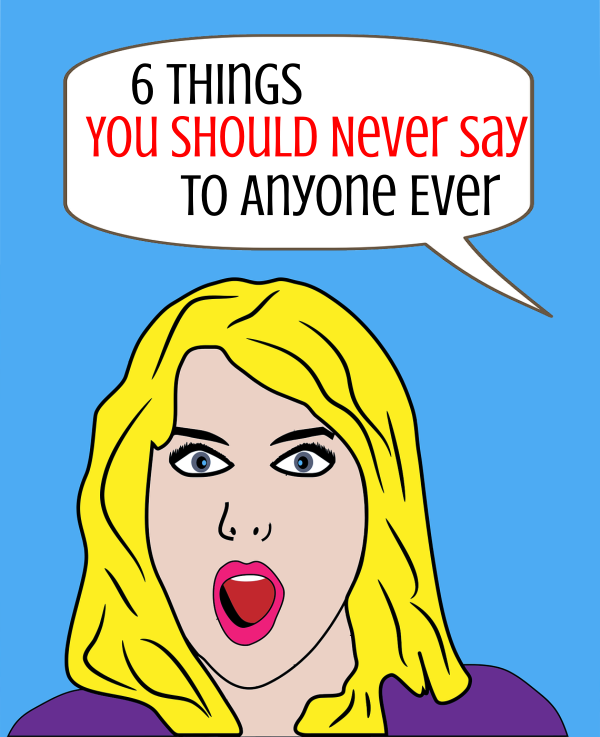 So I've simplified it for you, with this list of 6 things you should never say to anyone ever. You're welcome. #1: What do you do for a living? This seemingly innocent get-to-know-you question could potentially be offensive on so many levels. Besides the obvious fact that you may hit a sore spot with people who are looking for work or hate their current job, let's pretend you've just said this to a mom you met at your kids' 4th grade recorder concert. If she's a stay-at-home mom, then you've basically just insinuated that being home with your kids full-time isn't real work and that's a real pig-headed thing to say. But if she also has a career outside the home, then how dare you imply that her life's most important work is something other than raising her children, you insensitive toad. #2: Are you reading any good books right now? How many enemies are you looking to make today, with a question like that? You, with your smug expression and your Kindle under your arm. Did it ever occur to you that maybe some people just don't have time to read and feel badly about that? How could it ever be a good idea to bring that up and reopen the wound? Really? Is this a contest? People never get tired of trying to one-up each other, and it's a surefire way to end up with hundreds of angry articles on the Internet called "An Open Letter to the Jerk in Line at Wal-Mart Who Said He Was Tired" directed right at you. And you'll have no one to blame but yourself when they go viral. Even if you're not outright insinuating the other person isn't tired because they don't work as hard or they have a more frivolous life than you, it will absolutely come across that way. Definitely. Did they even ask if you're tired, anyway? Why is it always about you? Saying anything about yourself invites comparison and is just deliberately going out of your way to alienate people. #4: How was your day? Maybe they've had a bad day, and they don't want to talk about it. Shouldn't they be the ones to decide if they want to share personal details about their life with you, anyway? No one owes you a run-down of their day, so stop interrogating them already. This question shows zero respect for other people's personal boundaries, and quite frankly, casts your unwarranted judgment on all their life choices up to this point. However, the alternative to asking about someone's day is not asking about their day, which clearly proves that you're a self-centered egotist who probably runs over fuzzy baby chipmunks on the road on purpose. Proceed with caution. #5: I like your shirt/scarf/hat. Where did you get it? Or maybe they'll be embarrassed that they even bought it at all because they're trying to save the planet and only own upcycled things they found on the curb on garbage day! Any way you slice it, you simply cannot say this to someone or civilization as we know it will crumble to the ground. #6: Wow, it's really hot/cold/cloudy/rainy today. If you talk about the weather with someone, you may as well be wearing a flashing neon sign that says, "I don't care to get to know the real you so I'll just make banal small talk until you go away." How offensive and presumptuous of you, and really, it's just displaying your own ignorance because every person is worth getting to know. There's hardly another topic I can even think of that could be as inflammatory as the weather. If the Internet has taught me anything, it's that you can't say anything to anyone without offending them. So it's probably best to just avoid leaving the house — the last thing I want to do is meet a human and then be forced to say something to them. Love your tongue in cheek humor, ha! People get offended so easily these days. I just say what I want and if I offended someone, oops. I ask a lot of those questions you mentioned. Especially the book one! Lol!! Bless your heart. Maybe hi is still safe?? So... we just probably shouldn't talk anymore, right :)I also like the whole not leaving the house idea too, I am usually a hot mess when I do! The weather, though. Best small-talk ever for that awkward moment when you are with someone for less than 2 minutes but don't actually want to talk to them. I've been told off a couple of times for asking people what they do but I'm taking a stand because it's ridiculous. This is how you spend the majority of your waking life if you have a problem with answering it (raising children, looking for work, volunteering, taking a break and enjoying life all fabulous answers) you need to look at yourself and not the person asking. On a serious note: whatever you do, own it!